Many types of shoes have been used over the centuries to protect the feet of the horse. 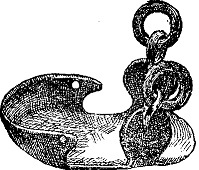 In many cases shoeing has not changed a trememdous amount. Nails have been used for many centuries and, of course, are still being used today. However, the Romans had a way of protecting the horse's feet that did not use nails. These shoes were referred to as hipposandals or kureisen (cure shoe). They were made out of iron. The shoe was fastened to the horse's hoof by straps. These shoes were used on metalled roads and taken off when not needed. It is thought that draft animals also used these shoes. 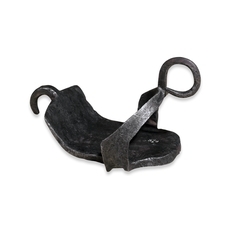 The metal was thick and a tread was put on the under side of the hipposandal to give better traction on the road. The "Kureisen" (cure shoe) was for diseased hoofs.